Leadership roles which are used throughout the meeting. New members work through ten modules from a Competent Communicator manual. This is effectively ten speeches. Once you’ve past these, you can then tackle the Advanced Communicator manuals which have specialist talks: for example, humour, technical presentations, facilitation, story telling and many more. In the formal speeches part of the meeting members will have given notice that they’d like a speech slot and they give speeches on a topic of their choice but following the guidance of the manuals. The guidance is intended to strengthen particular skills and to allow members to focus on that skill. For example, new members work through organising a speech, the general and specific objectives, style, body gestures and more. Here’s club member, Murali, in one of his earlier speeches from the Competent Communicator modules. Ever been caught on the hop and expected to get up and give a short speech unexpectedly? Chances are, you’ll be asked to speak on something that you know about. At Hull Speakers, you’ll be given a topic completely blind. By the time you’ve had a few sessions of what we call, “Table Topics,” you’ll never worry again about off the cuff speeches. Every speech is evaluated and every role. This simply means that other members are assigned to pay particular attention to a speaker, or a role, and to give feedback. The group as a whole will also give feedback to speakers. This is like having your own personal team to tell you what you did which came over to the audience as very strong and also areas that you could look to improve. Here’s Steve, introduced by Michael, giving an impromptu speech which is followed by an evaluation. Don’t forget, for impromptu speeches, the speaker has no idea what they will be asked to speak on. They are given a topic and apply various techniques to deliver the short speech. Don’t worry, whilst we encourage visitors to do this on their first meeting there’s no pressure. But you’d be amazed how many people, even the most shy, watch a few speeches and then with to join in. The club is very relaxed. You’ll soon learn that most speakers do not arrive as gifted orators and their aim is to get better and better at public speaking over time. The members of the club help each other do this. 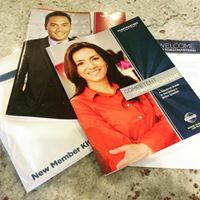 Members use manuals to guide them as to the skills to acquire and the opportunities to use them. Because Toastmasters is a not for profit organisation run for the benefit of its members the club is run by the members. We have a Committee, elected annually. In the actual meetings we ask members to volunteer for roles. New members get used to speaking situations by performing a role meeting if they wish. These are Timekeeper (timing speeches and reporting on how speakers do), Grammarian; this word looks out for effective use of spoken English and interesting words, Ah Counter; this role counts the ‘filler’ expressions like, ’em’ and ‘ah.’ You’ll be told of these if you use them, or similar expressions. Each week you will be amazed, if you use them (and most people do) how you first become aware of it and then develop techniques, like pauses, to avoid using it. Here’s a speech from a more advanced speaker, Clare, who effectively uses pauses rather than filler words. Clare’s gasps are intentional to show the emotion of the speech which is a sharp contrast to people who use the “ah” to fill a space. Lucky Dip: What Did We Choose? Technology in Our Lives: Good or Bad? Double Winners: Alison and Lincoln.